Britain, Northern Rhodesia and the First World War: Forgotten Colonial Crisis (Studies in Military and Strategic History) est le grand livre que vous voulez. Ce beau livre est créé par Edmund James Yorke. En fait, le livre a 360 pages. 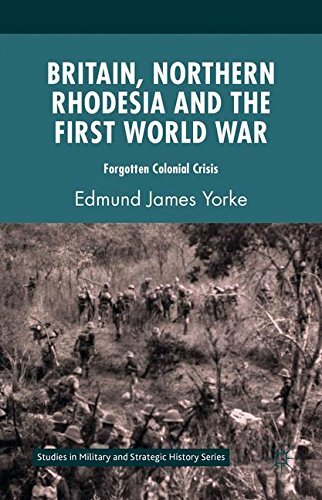 The Britain, Northern Rhodesia and the First World War: Forgotten Colonial Crisis (Studies in Military and Strategic History) est libéré par la fabrication de Palgrave Macmillan. Vous pouvez consulter en ligne avec Britain, Northern Rhodesia and the First World War: Forgotten Colonial Crisis (Studies in Military and Strategic History) étape facile. Toutefois, si vous désirez garder pour ordinateur portable, vous pouvez Britain, Northern Rhodesia and the First World War: Forgotten Colonial Crisis (Studies in Military and Strategic History) sauver maintenant. Britain, Northern Rhodesia and the First World War is an insightful account of the devastating impact of the Great War, upon the already fragile British colonial African state of Northern Rhodesia. Using extensive official and private records from Britain and Zambia and the testimonies of a few surviving African veterans, Edmund Yorke investigates how rapidly rising imperial war demands caused immense distress and discontent amongst the African population. With widespread famine, spiraling death rates and demands for thousands more African carriers and soldiers, this book examines how African resistance rapidly mounted. Examples of rising African desertion rates and mass refusal to pay colonial taxes as well as direct defiance of military recruiters are highlighted, as are brutal reprisals by both military and some colonial officials; eventually revealing how, finally, only news from Europe of the arrival of the Armistice saved Northern Rhodesia from total collapse.